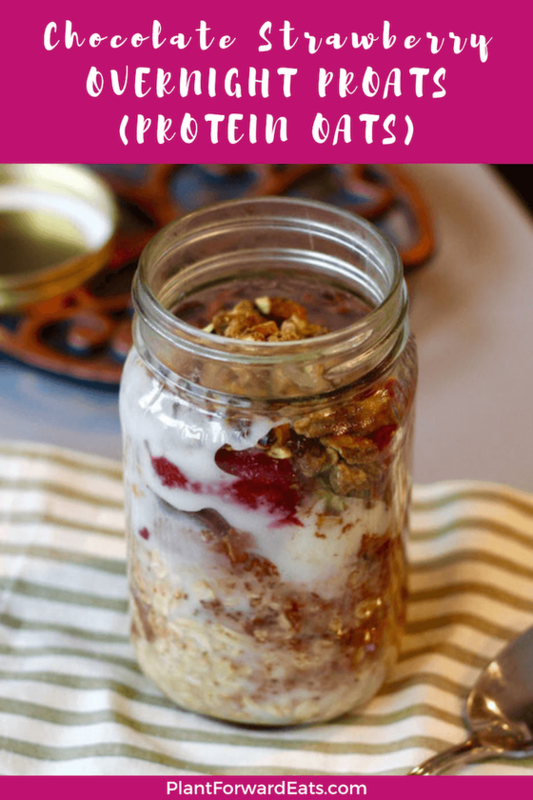 With this easy-to-make overnight oatmeal, you have no excuse for not eating a healthy breakfast! The best part is these overnight oats taste like dessert but with no added sugar. This has been an incredibly busy month. My boyfriend and I are moving apartments in a couple of weeks, so we're busy packing boxes and setting up our new kitchen (we have a two-week overlap so are prioritizing getting this very important room set up first). But even without the pending move, my calendar is pretty packed with holiday gatherings and out-of-town visitors this month. While I'm always looking for a quick, delicious, and healthy breakfast, this is especially important now while time is such a commodity. I love overnight oats (if you do, too, check out my Mango Banana Almond Overnight Oats). 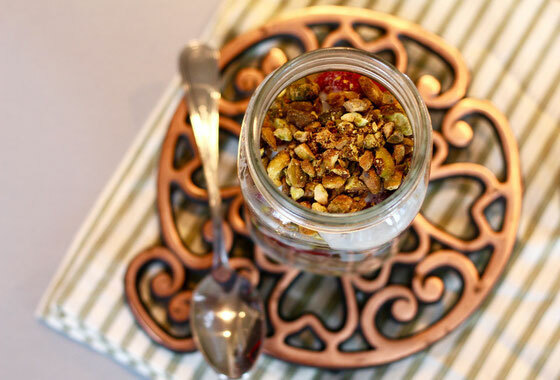 I also love pistachios, strawberries, oats, coconut, and chocolate, so I put all of these ingredients together to make a delicious overnight oats recipe. The frozen strawberries create a delicious juice while they thaw overnight, the pistachios offer a satisfying crunch, and the unsweetened cocoa powder sweetens without added sugar. The best part? This breakfast will stick with you all morning. The overnight oats recipe offers 21 grams of protein (42 percent of your daily need) and 8 grams of fiber (32 percent of the daily value), as well as healthy fat to help keep you fueled for those busy December mornings! Looking for more delish pistachio recipes? Try pistachio milk and pistachio chia pudding! Also try an overnight barley breakfast recipe. 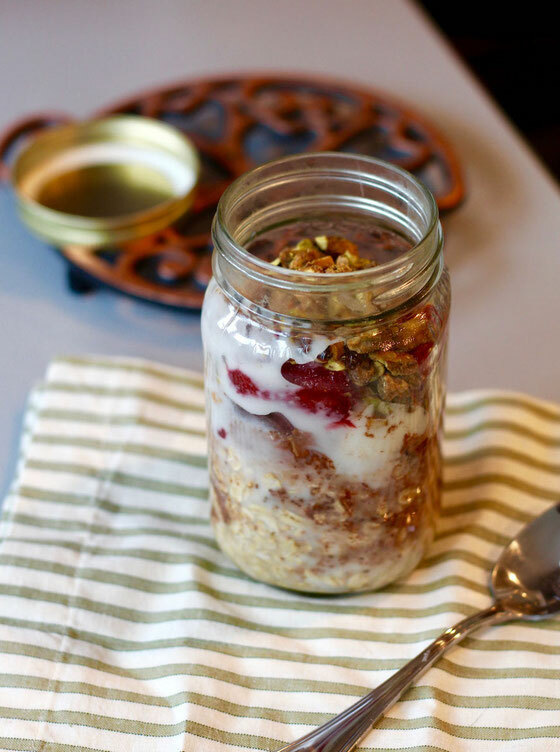 In a mason jar, combine oats with milk, 1/4 cup and 2 Tbsp. yogurt, vanilla, and cocoa powder. Mix, then top with frozen strawberries and remaining yogurt. 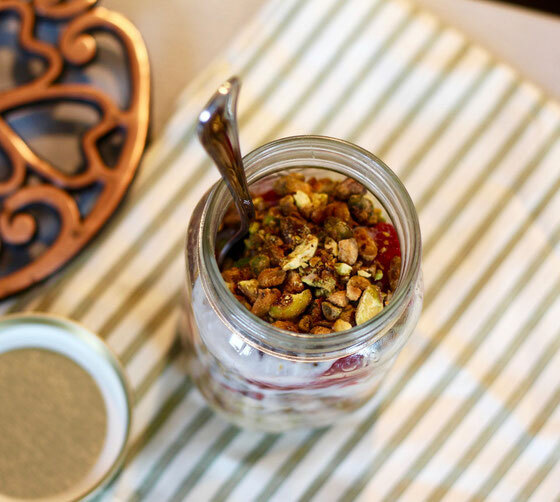 Cover jar with a lid, and refrigerate for a few hours or overnight, then top with pistachios. Serves 1. What are your thoughts on this topic? What's your fave way to eat oats?